Recogidas, 53, 18005 Granada, Spanje. Business hotel in the centre of Granada. 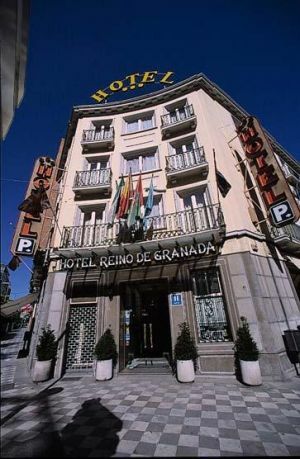 Reino de Granada Hotel is a central establishment ideal for holidays, as well as for business trips to Granada. The hotel is placed in the heart of the city, at 8 minutes by car from the Congress Palace, a quarter of an hour from Granada airport and with direct access to the motorway which links the capital and Motril. Its highly comfortable rooms are totally equipped, being adapted to the necessities of those travelling with business purpose, and for the tourists visiting the city of Andalusia, as well. The rooms offer a comfortable writing desk and Wi-Fi connection. 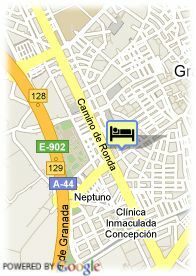 The establishment is surrounded by the best restaurants from Granada. Betalende overdekte parking aan het hotel (16.05 €), Reservatie verplicht. Voor oudere kinderen en volwassenen wordt 16.05 € per extra bed aangerekend.